Buicky portholes and extra bowties, plus a spoiler ... no. Just make it stop. American flag continental kit hanging off the back? Check. Plastic testicles hanging below? Check. Bowtie decals? Check. All systems no! Seriously? Of all the mirrors you could have possibly screwed to the fenders of your chrome-laden Pontiac Parisienne, you chose these? Yes, I know it's only a show display. Doesn't make it right. Spotted at the New York Auto Show - it was downstairs among the exhibits. Somewhere under all that, there's a poor, abused Ford Torino. The artist apparently makes the shapes in plastic with a 3D printer and then transforms them into metal. I believe "Why?" is the key question here. The wing adds an extra 15 horsepower, I'm sure. Someone should outlaw the self-tapping screw. And two-sided adhesive tape. Really. Just stop it, right now. The sign says this is a Rolls-Royce that was built by Alfredo Vignale Coachworks in Italy in 1955 for a customer in New York. Factory records say it's one of a kind. I say, thank heavens for small miracles. Oh, and it can be yours for $500,000. You can use it to scare the kiddies on Halloween, or car-loving adults during the rest of the year. A whole new level of stick-on awful. Unfortunately, I couldn't get my camera out quickly enough to capture the front end. You'll just have to take my word for it that it was very, very bad. Why stop at one horse on the hood, when two are ... well, more? The spoiler really finishes it off. Large, thin plywood sheet tossed on top of vehicle? Check. Loosely tied in two places with thin twine? Check. Both driver and passenger have hands on load, which will be enough when the wind catches the edge of it? Check ... and full speed ahead! Spotted by a friend at a car show in California. Words just ... well, they fail me. Fake portholes? Check. Fake scoop? Check. Dual Hemi decals? Check. Oversized grille topper? Check. All systems go! This is beside a large street in Munich, Germany, at the base of a statue. I spotted it a couple of years ago, and then on a recent trip, discovered that it's still there. It's a shrine to Michael Jackson, complete with photos, handwritten notes, stuffed animals, candles, and for the season, Christmas decorations. Spotted in Munich. What is it with sticking every badge you own on the same vehicle? The reindeer antlers and red nose are bad enough, but candy canes...? Spotted at the SEMA aftermarket show in Las Vegas. It's built on a Dodge Charger, and the owner wanted $70,000 for it, primarily because he used a Rolls-style grille. Unfortunately, that's about $69,995 more than I'd want to pay for it. Spotted in Las Vegas. Perhaps all those portholes are his version of air conditioning. It has Buick-style chrome portholes, too. You Can, But You Absolutely SHOULD NOT! Now, if you visit this site regularly, you'll know that I often post pictures that show that You Can, But You Shouldn't. And some of them are pretty incredible examples of what people can do when they go a little crazy with self-tapping screws and two-sided tape. But every now and again, you come across one that's so far out there, it would take an Academy Award if such a category existed. And thanks to a tip, I found it. I can't repost it here, because it isn't my photo, but it just has to be seen. Don't say I didn't warn you. One ... two ... three ... click! You'd never know that he fixed it himself! People, please ... two-sided tape is not your friend. And less is more. Remember this: the last time Cadillacs looked good slathered in too much extra chrome, they also had fins. Another beauty from the Malaga Auto Museum in Spain, designed and built by the museum's team. It's called "La Bomba" and, according to its sign, is "an example of power and strength, as well as beauty." Truly in the eye of the beholder. A gem from the Malaga Auto Museum in Spain, built by customizers there and apparently commissioned by the museum's owner. It's a 1934 Ford with "widening of the fenders that give the car strength and elegance," according to its sign. 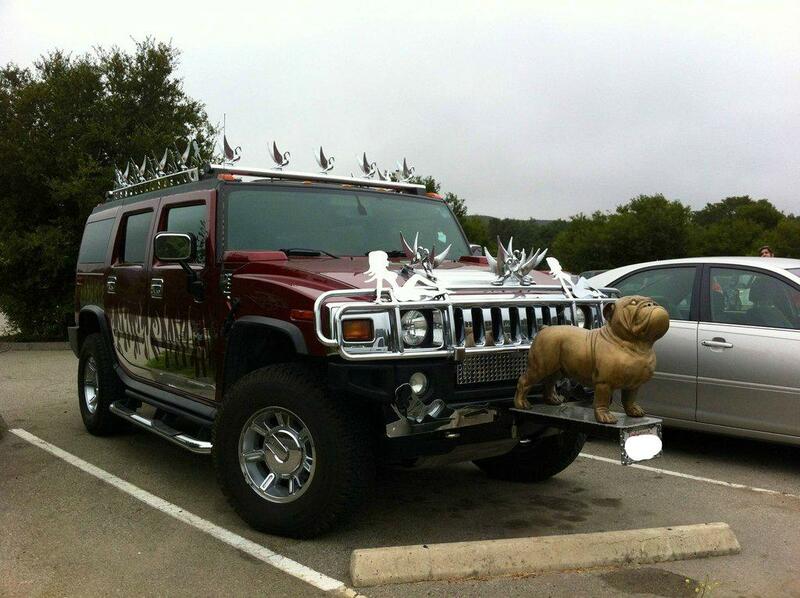 A "hand" hood ornament and crystal-swathed windshield complete the look. I remember when this style of hot rod - basically a Ford body dropped onto a chassis, with fenders to cover the frame - was popular over here. It wasn't for long. There's a reason for that. A gem from the Museo Automovilistico Malaga, an auto museum I visited in Spain. While it houses a remarkable collection of restored vehicles (a surprising number of them American models), it also contains several cars built by Spanish customizers, apparently commissioned by the museum owner. These are also remarkable, but for different reasons. If the reindeer antlers and red noses at Christmas aren't enough ... now we have the Easter Bunny. A snowplow front end and too much happening on the hood do not a fine Camaro make. They're supposed to be exhaust stacks, not factory smokestacks! Discovered on a street in Munich. Words fail me. Spotted in Munich. Buddy, what did that poor BMW ever do to you to deserve those wheels?